There are many varieties of Chinese soup, some delicious and others quite horrifying. I once ate something with gelatinous globules which later turned out to be rehydrated frogs’ eggs. We were suspicious when my mother refused to drink it herself, despite her insistence that it was “good for children”. Needless to say as a child, I actively disliked soup, particularly the medicinal kind, and would run away whenever it threatened to appear. Questionable ingredients aside, it isn’t particularly pleasant to drink scalding hot soup in the tropics where the humidity can feel like a wet towel pressed against your face. Cold weather, however, is a different matter. The other day I made some plain Chinese chicken soup. This is the basis of many recipes and the plainest nourishing fare for an invalid. Unlike Western chicken soups, which are often designed to use up chicken scraps and bones and rely on vegetables such as onions, carrots, celery etc. to boost their flavour, Chinese chicken soup is extravagant and demands the whole chicken. In fact, in its purest form, the goal is the extraction of chicken essence, with the meat and bones discarded. A whole small chicken is steamed in a special ceramic vessel, which distills the chicken juices without the addition of any liquid. This golden, intensely chickeny essence is widely touted as a cure-all. There are even special breeds of chicken, such as the fluffy white, black-skinned Silkie, which are prized for broth-making. I don’t bother to do this, neither do I use the whole chicken (though you can, if you like). Instead, packages of chicken drumsticks work well — they’re meaty and have a good ratio of bone and soft cartilage, which Chinese people swear is good for your joints. In America, drumsticks are not too expensive because dark meat is undervalued (the reverse is true in Asia). – knob of ginger, about ¾ inch long. Less if you’re not so partial to ginger, though it’s supposed to help digestion. – splash of rice wine. In general, I don’t use Chinese cooking wine that is sold in American supermarkets e.g. 99 Ranch. It’s cheap, heavily salted (so it can be sold in the grocery aisle) and tastes horrible. Instead, I use Japanese sake. You don’t have to buy a great drinking sake, just a cheap bottle will last a long time in your pantry and taste infinitely better. Plus you can drink it if you don’t plan on cooking lots of Asian food. 1. 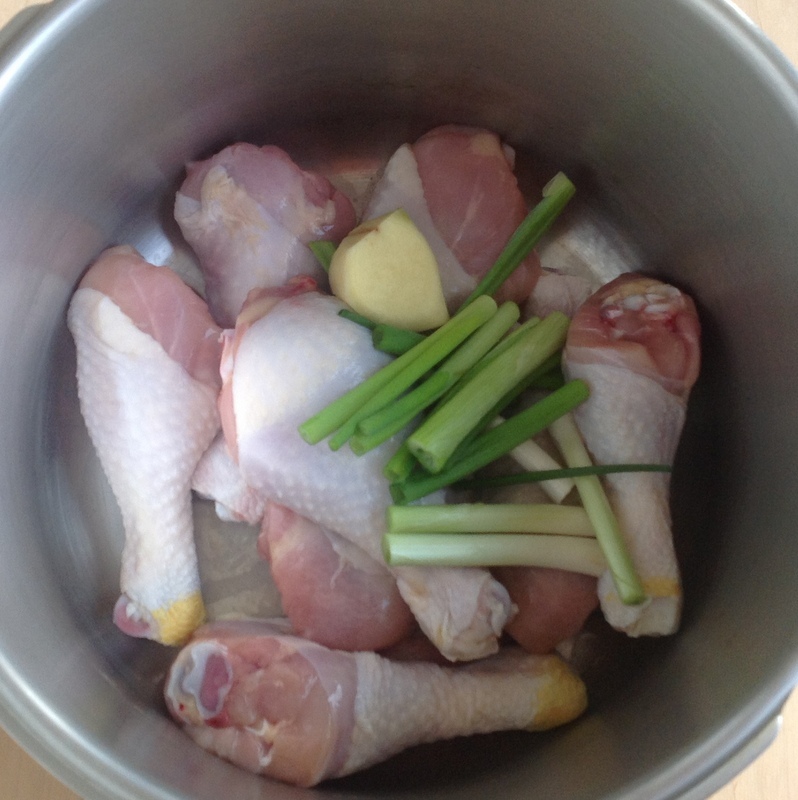 Rinse the chicken drumsticks and put them in a pot. Salt them lightly (you can always add more salt at the end). I use a pressure cooker, which I highly recommend for all sorts of things from buttery, fall-off-the-bone lamb shanks to soups and beans of all kinds. 2. Rinse the green onions, cut off the tip of the roots and discard old leaves. Cut into 2-3 inch lengths. Peel the skin off your piece of ginger and slice into two, if you like. 3. Just barely cover the chicken with cold water and add a splash of rice wine. Seriously — use very very little water. Too much water will dilute the end result. The goal is chicken essence. If you’re using a regular pot, however, you might need a little more – check while cooking as the water will evaporate. 4. If using a pressure cooker, close lid and bring to high pressure. Start timing at this point and reduce heat to maintain pressure. Cook for 30 minutes, then allow to depressurize naturally. For a regular pot, bring to a boil then maintain at a gentle simmer. Cook for an hour and a half, or more, skimming the scum off occasionally. By the end, the meat should be falling off the bones. If not, simmer a little longer. The longer you cook it, the stronger the broth, but the more tasteless the meat will be. My mother-in-law actually keeps a pot boiling at a low simmer for hours. When she spoons soup out, she’ll add a bit of water back in and let it simmer to stretch the stock. You can also do this in a slow cooker. 5. Taste and add salt. It should have an intense, chickeny flavour. If you’ve used a pressure cooker, even the bones will be slightly soft. Season to taste with salt, pepper, and a little sesame oil if you like. Serve with sprigs of fresh cilantro or green onion. You can eat the meat and cartilage by dipping it in soy sauce, or shred it and add a little sesame oil, pepper, and soy sauce for some other use. Or if it’s completely tasteless, discard it or give it to your pet (after removing the bones). When cooled, the soup should gel. This is the most basic Chinese chicken soup and can be dressed up with the addition of things like a scant handful of goji berries, Chinese dates, lotus root, bak hup (dried lily bulb) etc. These will all change the taste, so you might want to try it plain first. Try adding noodles or rice to make a meal of it! This makes me want to go home and make some chicken soup. It sounds essentialy like bone broth that turns gelatinous from all the natural silicon – very healthy! Great article. I love chicken soup, especially tithe Chinese style. We do the lazy chicken broth at home to stretch our 4.99 rotisserie Costco chicken. Dinner: chicken breasts and maybe a drumstick. Post dinner: Chuck the remnants of the rotisserie chicken into a stockpot and cover with some water, let it simmer overnight on low. Strain and discard chicken in the morning,bag broth and freeze! We haven’t bought chicken stock in years and on evenings where I don’t feel like cooking, I’ll defrost a bag of chicken stock, throw in some vermicelli, frozen squid meatballs, and some bokchoy. Pretty great post. I simply stumbled upon your weblog and wanted to say thst I’ve trfuly loved browsing your blog posts. How much chicken broth does this recipe make? It will make approximately as much water as you add to the chicken, plus a little bit. This is a fairly flexible recipe, so if you want to make more, just increase the number of chicken drumsticks and add a little more water. For the recipe as I made it, I think it ended up being about 1.5 liters of concentrated chicken broth. Feel free to adjust as you prefer.